Many bodybuilding websites advise you to combine two hormones—IGF-1 and HGH—in supplement formulas. It’s the kind of advice a fair number of bodybuilders seem to go for—anything to give them the extra edge. But is that a good idea? Let’s look at what these hormones are. Throughout life, HGH (human growth hormone) comes from the pituitary gland, whence it’s whisked throughout the entire body. The amount of HGH released declines with age. 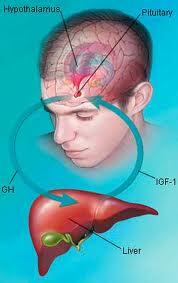 IGF-1 (Insulin-Like Growth Factor) is produced in the liver and works with HGH in an important way. In effect, HGH stimulates the need for growth, stimulating anabolic activity throughout the body, and IGF-1 carries out the growth—especially muscle growth. Indeed, both HGH and IGF-1 prove essential to muscle growth—the bodybuilder’s goal. But there’s a catch. Lots of scientific data indicate that high levels of HGH and IGF-1 will decidedly age you. Lower levels of IGF-1 protect against aging and certain types of cancer. When IGF-1 levels are low, new cell production slows allowing the body to concentrate on repairing existing cells. When IGF-1 levels are high, this signals the body to enter a ‘go, go, go’ mode, causing cells to grow and age too fast to be repaired. The result: accelerated aging. Eating less food in general certainly helps lower IGF-1 levels. A low-protein diet helps even more. And fasting is the quickest, most effective way of all to lower IGF-1 levels in order to assist the body in slowing the aging process. Research done at Baltimore’s National Institute on Aging evidences that fasting one or two days a week could protect the brain against some effects of Parkinson’s Disease and even Alzheimer’s. Sounds a bit daunting, that expression. Somewhat clinical and rather “hair shirt,” as well. But it needn’t be intimidating at all. My readers all know that fasting is one of the oldest healing methods known to humankind. Historically, many fasts were days in duration, even much longer. In contrast to extended fasting—say, three days and up—intermittent fasting means simply short bouts of fasting (water only, usually) interspersed with periods of eating, practiced on a more or less regular schedule. Indeed, in intermittent fasting, the period of fasting isn’t the exception, but rather is part of a planned pattern of eating. There is a wealth of evidence that such a pattern offers enormous health and anti-aging benefits, including an increased capacity to resist stress, disease, and aging. Ori Hofmekler, creator of The Warrior Diet was the first to offer a diet plan based on intermittent fasting. Skip breakfast and lunch and aim to eat one big meal per day, at night. For the most part, on his plan, you fast during the day. You’re allowed to eat whey protein, green vegetables, and berries during the day, but for maximum effect you fast until dinner whenever possible. There are plenty of ways you can perform your intermittent fasting, several of which are being researched. One method is “alternate day fasting,” where research participants eat whatever they want on “feast day,” then semi-fast the next day on a certain very limited number of calories—example: a small, calorie-restricted breakfast, then no food until the next day. Other versions of intermittent fasting programs include the one-meal-a-day regimen, fasting one or two days a week, and fasting once every other week. And of course, there’s me, with my Quantum Eating. Intermittent Fasting—so many methods, variations. What’s the best way? The best IF program for you: The one you’ll start and stick with, faithfully, comfortably, every day. It will depend on your daily routine, your kind of work or profession, your current level of health, your exercise schedule, your family life, and so on. The truth is, they’re all good, because each is a step in the right direction. Virtually every variation on intermittent fasting has been shown to reduce IGF-1 levels significantly, even by as much as 50%. All deliver benefits. To determine which variant of fasting is objectively better would require some extensive (and expensive) research testing one version against another. What’s more, even that unlikely research may just confirm what we know now—that all the major methods work, and each individual needs to find what works best for him or her. I’ve found Quantum Eating to be the optimal form of intermittent fasting for me. I have been practicing it since 2005, with amazing results. 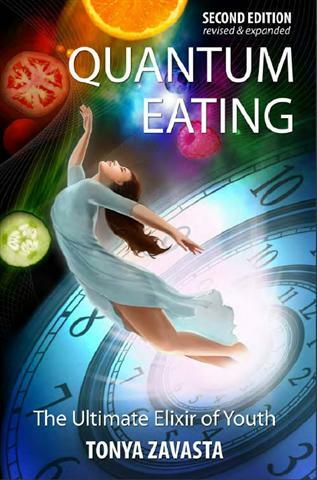 Quantum Eating—unlike some other plans—recognizes how special raw foods lifestyles are. Once your body adjusts to the quantum eating program you feel no sense of deprivation. Quite the contrary, any overindulgence becomes torturous, compared to the light, energized feeling of eating in moderation. With Quantum Eating, especially when you go raw, you never stress your digestive system on ‘feast days’ by eating too much or by eating the wrong foods, leaving you reaching for Alka-Seltzer. Since you do not eat at night in the Quantum Eating lifestyle, there’s no danger of overeating and going to bed on a full stomach. When you eat only raw foods, and only in the first half of the day, leaving the second half of the day and overnight for fasting, you’ve developed an advanced form of intermittent fasting. When you become accustomed to a daily pattern of eating and non-eating cycles, such brief periods of hunger as you’ll experience really won’t feel like hunger at all, and in consequence you won’t “beast out” when it’s time to eat. Quantum Eating keeps you at an even keel every day. No swinging “binge-purge” pendulum! Quantum Eating is simple and uncomplicated—physically, emotionally and spiritually. It has worked wonders for me, and if you approach it sensibly, it can do the same for you. If you have any doubts, read the book, now in it's Second Edition. It will address all your questions. 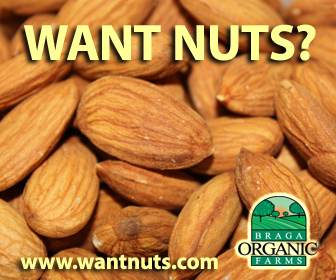 Are There Any REAL Superfoods?